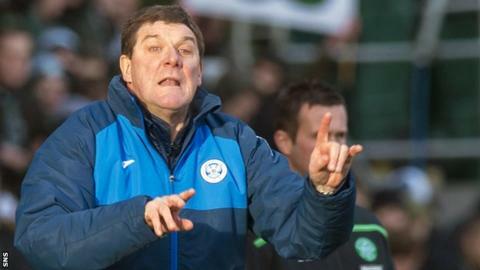 St Johnstone manager Tommy Wright is in favour of a 16-team Scottish Premiership but believes it will only happen if there is a better TV deal. League restructuring is returning as an issue as an agreed three-year period of stability comes to an end. "The only way a 16-team league is going to happen is if we get the proper finance and commercial deals into the game," said the Saints boss. "But it needs change and a 16-team league would bring freshness to it." Wright was speaking after Mark Warburton, whose Rangers side lead the Championship, came out in support of league restructuring. Celtic manager Ronny Deila thought there could be benefits from a larger league but suggested there would also be negatives and that he would reserve judgement until seeing the details of any possible proposal. Wright says the managers have discussed the matter with the Scottish Professional Football League's chief executive. "The managers, we have a meeting with Neil Doncaster at the start of every season and reconstruction comes up," he told BBC Scotland. "I would say most of the managers would like to see change, but it comes down to finance. "A 16-team league with less home games, financially the revenue would have to come in from TV and commercially we would have to sell it and make sure that we get the right value for it. "Because I do feel that Scottish football is probably undervalued a bit. "We need to get better value for the clubs and I think, if you saw that, most chairman would go for it." Wright believes there are enough quality clubs to sustain a 16-team top flight. "With the emergence of the likes of ourselves, Ross County, Inverness, the fact that Rangers, Hearts, Hibs have been out of the top league, I think quite easily you could get a 16-team league which would be competitive," he said. "I don't think it would dilute the quality." Wright pointed out that Dundee United played Celtic seven times last season because of cup meetings over and above the four Premiership fixtures. "It is good if you are only playing each other twice and I think it would maybe help bring through younger players as there would be less pressure," he said. "Jim McIntyre touched on it that Ross County are seven points off third and seven points off the play-off place in a 12-team league. "You can think everything is going nicely and then have a bad month and you are down near relegation." Rangers director Paul Murray believes the league has to tap into the ideas of those involved in Scottish football who have built international businesses - like Hearts' Ann Budge, Partick Thistle's Billy Allan and Ross County's Roy McGregor. "My own view is that we have to talk to the paying customers more - what do the fans want?" he added. "No business organisation survives without talking to its customers and, in Scottish football, there hasn't been enough done with the fans. "Do they want summer football? Less games? More games? Games on a Friday night?"